Etowah Outfitters is a southern manufacturing company which specializes in ultralight backpacking, bushcraft and adventure gear such as solid fuel and alcohol stoves, ultralight weight tarps and tents, rain gear, Rainwraps, and stuff bags used in boy scouts, adventure racing, backpacking, camping, kayaking, canoeing, adventure travel and outdoor sports. No matter what kind of outdoor activity from day hiking to woman adventure travel, our equipment and products can lighten your load and enhance your outdoor experience. Thank you for the privilege of providing simple gear for the last 20 years, and we look forward to providing goods for many, many, more. 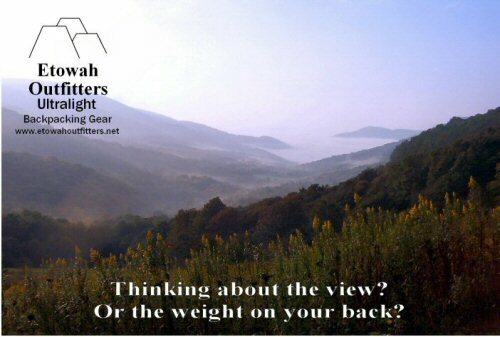 Backpacking Gear reviews for Etowah Outfitters products. Ultralight backpacking buzz. You will be able to get the buzz about new postings in the magazine and on the site. Retailers only. Requires access code. An excellent Trail Days Video documentary of the 2009 event in Damascus, Virginia.